Ephraim McDowell Regional Medical Center has unveiled a cleaning robot that utilizes ultraviolet light technology to clean patient rooms. This new robot, by Xenex, already has a general practitioner on standby. That robot doctor is Steve Knight of DanvilleComputerDoc.com. In order to qualify to be the robot’s primary care physician — Knight had to study the design and build of the robot, pass written examinations on the repair and care of the Xenex robot, and become Xenex certified to handle any and all “ailments” the machine might have. 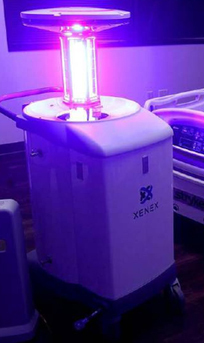 The robot star was recently featured in the Advocate Messenger and the Computer doc is looking forward to working to keep his patient healthy, so the Xenex can work hard to keep our local facilities germ-free and help promote the wellness of EMRMC’s patients and our community. The Xenex robot joins a long line of computers, networks, companies and tech-loving individuals that Danville’s own Computer Doc helps to keep healthy and happy.